While affordable, sometimes IKEA furniture can be a little, well, boring. In this list of the best IKEA hacks, we detail 20 creative ways to take your IKEA furniture to the next level. For most of these projects, only simple DIY skills and supplies are required, making excuses hard to come by. So, if you want some stylish and unique furniture, or if you just want to flaunt your creative hand, take a look at this list. 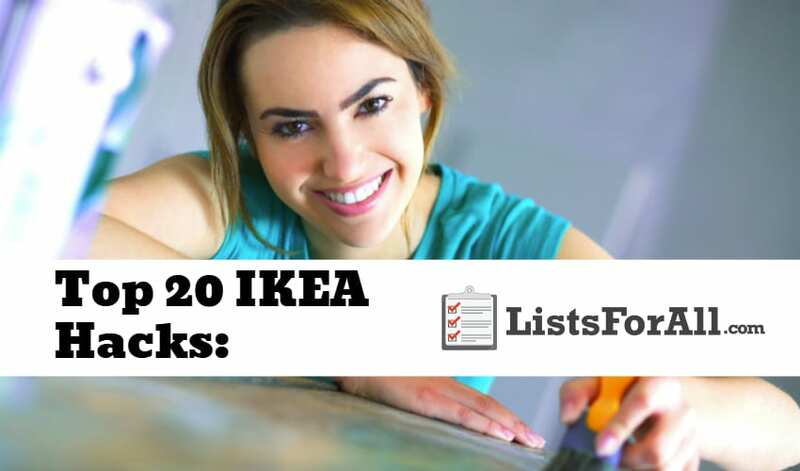 Be warned, however, after reading this list, a trip to IKEA and the hardware store will probably be in your near future. 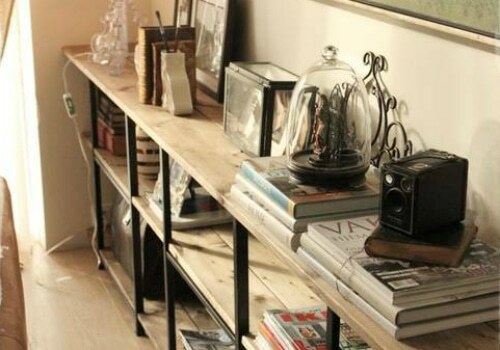 And, if you still have the crafty feeling after your IKEA hacks, take a look at our list of the best shelving ideas. You may just want to tackle another DIY! Elegant and glam, this gold leafed console table is a hack of IKEA’s Besta Burs Desk. It is the perfect project for first-time DIYers. A gold leaf kit is in the instructions, making it easy to gold leaf virtually anything. 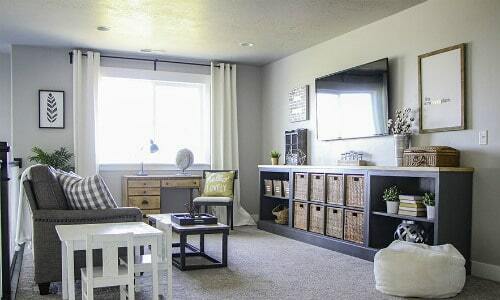 If you are looking for an airy, stylish piece for your hallway, living room, or bedroom, this hack may be just what you are looking for. A hack of IKEA’s Locksta Easy chair, this hack does require some sewing prowess, but the result is beautiful. 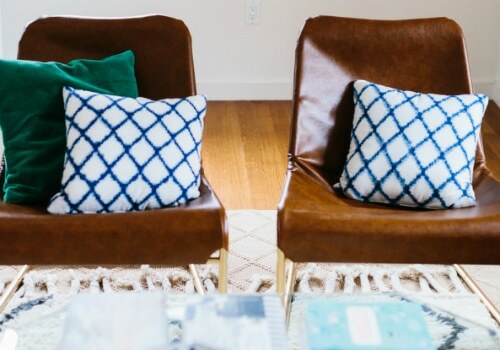 While gold spray paint and bonded leather fabric were used in this leather lounge chair hack, you could easily substitute your own finishes for another fun and unique piece. This hanging organizer is great for those that are short on space. Made from the IKEA Sultan Lade slatted bed base, it is a great way to maximize your vertical space. 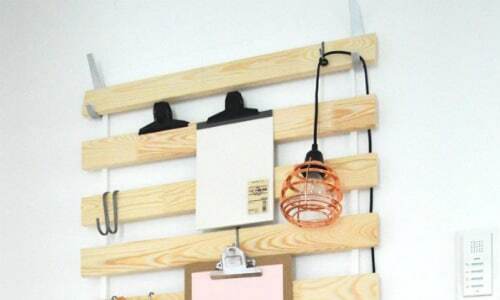 After attaching the slatted bed base to the wall, simply use S hooks to hang a variety of items. You could even use the bed base to create a vertical hanging garden! Combing a bookcase(s) and IKEA cube storage, this long storage unit is perfect for storing away everything you want out of sight. With similar storage units costing significantly more, this hack is a great way to save money while still getting a quality piece. 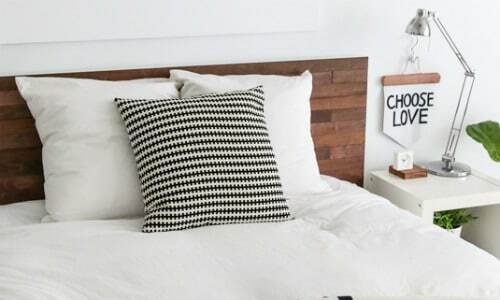 Using the IKEA Malm headboard, or something similar, this hack uses reclaimed wood with adhesive backing on it to cover the headboard for a unique, rustic look. This hack requires minimal DIY skills, so give it a shot! Combining Kallax shelf units, drawer kits, and fabric boxes, this hack requires a bit of DIY skill, but the end result is worth it! 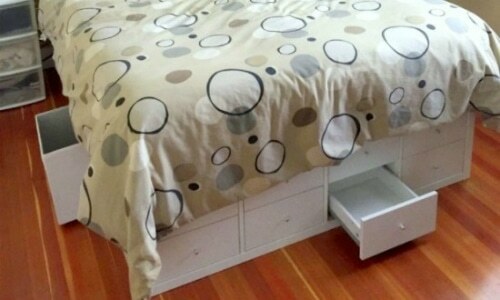 If you are always running out of room for clothes and need a good bed frame, this is the hack for you! This hack repurposes the IKEA Vittsjo TV unit as a pretty and functional gold upholstered storage bench. As a bonus, since the TV unit already comes put together, there is minimal DIY with this hack! 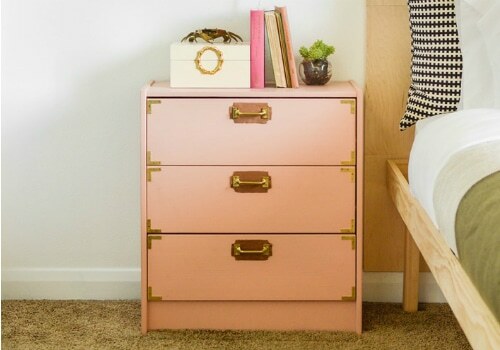 If you want to jazz up your IKEA dresser, this is the hack for you. The IKEA Tarva dresser transforms into a beautiful showpiece. This dresser hack would fit great in any bedroom. For an amped up, expensive looking sideboard makeover, this is the hack for you. 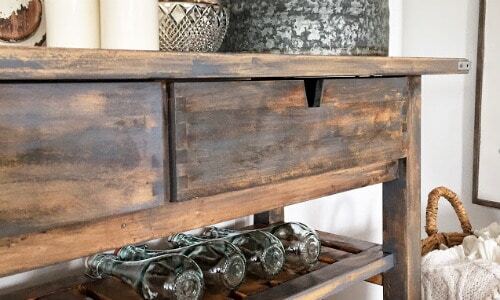 Using stain, wood wax, and L brackets you are going to transform the Norden sideboard into a great looking piece. Have you always wanted a rustic, chunky mirror, but don’t want to shell out the big bucks? Give this IKEA mirror hack a try! With some simple sanding, painting, and L brackets, this standard IKEA mirror turns into something special! This IKEA Raskog utility cart makeover is as easy as 1-2-3. Start out by choosing the spray paint of your choice (rose gold is used in this tutorial) and some spray acrylic coating. 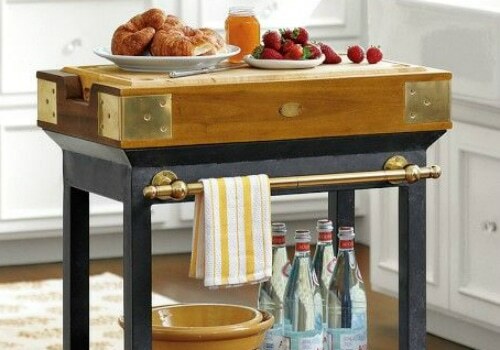 From here you can transform a run of the mill cart into something luxe and glamorous. While IKEA Lack coffee tables are inexpensive, they can be a bit boring and lackluster. This hack is a great way to jazz up these lackluster coffee tables. 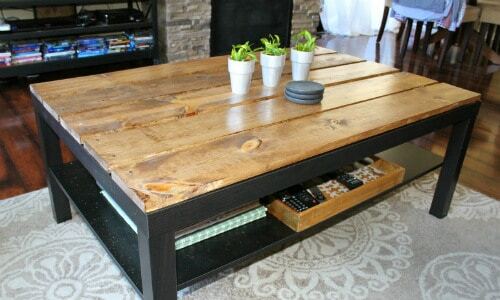 With precut wood (most home improvement stores will cut the wood to size for you) and some simple stain, the LACK coffee table becomes a rustic, one of a kind piece. Off the shelf campaign dressers can be quite expensive. This hack is going to allow you to get the look you want without blowing your budget. 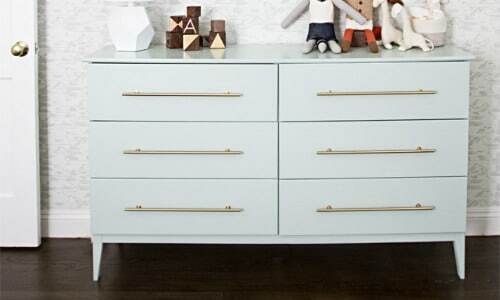 You are going to be able to transform the IKEA Rast dresser into a fun and stylish leather and brass campaign dresser. For a perfect finish, follow the paint tutorial in the directions and then pick up inexpensive pulls and knobs from any hardware store. With just a little spray paint and some marble, wood, or copper contact paper, this IKEA PS side table is wholly transformed. This piece is going to be perfect for the living room, bedroom, or any place you need some open storage. This nightstand four ways is a quick and easy way to inject some glamour into a space. And, with these instructions, you have four great and stylish finishing options! If you are on the hunt for an elegant and compact vanity, look no further. This IKEA hack attaches tapered legs to the EKBY ALEX shelf to make a creative modern vanity with storage. Wall anchors secure the vanity to the wall and free up floor space. This is going to be the perfect vanity for small areas. Kitchen storage need not be common and boring. 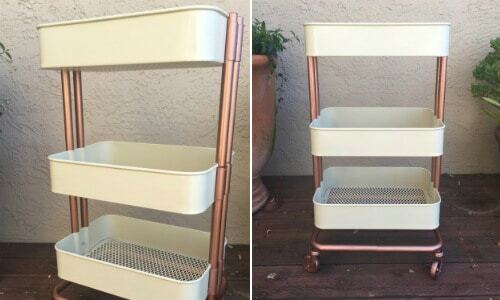 In this IKEA hack, the Bekvam Kitchen Cart receives a classic, yet industrial makeover. The addition of brass and an electrical conduit bar makes for a fun towel bar/handle. Also, the gray paint and marble transform this kitchen cart into something special. From bookcases to a kitchen island, this IKEA hack is genuinely transformative. 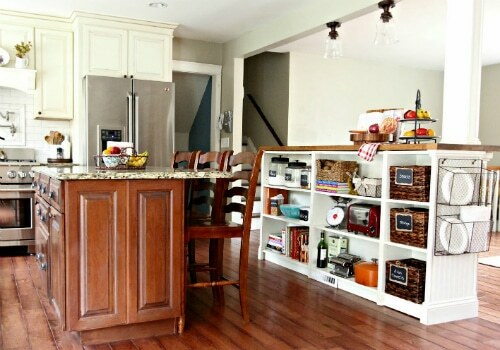 Three IKEA Billy bookcases, as well as an IKEA Numerar butcher block countertop, comprise this stylish and spacious kitchen island, while beadboard and corbels dress up the outside. 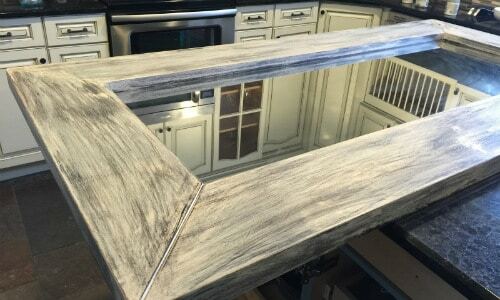 If you have always wanted a kitchen island, but just haven’t been willing to shell out the big bucks, this may be just the project for you. Pre-made industrial shelving can often be quite pricey. This hack is going to be reasonably priced though and will allow you to get the industrial shelving look. As a warning, this project is a little bit more involved than some of the other hacks on this list. It is a perfect fit though for DIYers who already have some completed projects under their belt. 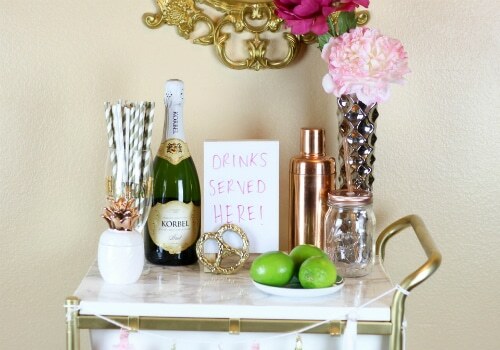 In this hack, the IKEA BYGEL Utility Cart transforms into an elegant and stylish gold and marble bar cart. While elegant and stylish, this hack is inexpensive – the “gold” is just gold spray paint, while the “marble” is marble contact paper. For an easy makeover, have an X-Acto knife on hand. 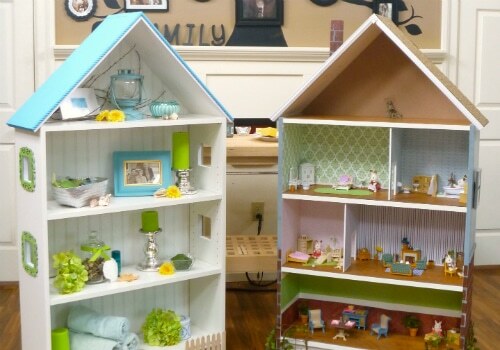 Another Billy bookcase transformation, this hack will create the dollhouse of your child’s dreams. While design and décor tips and instructions are provided, there are endless possibilities that you can create. If you want to fly your creative flag, this is the perfect hack for you. Completing a task on your own brings a certain sense of self-confidence and fulfillment. Add in having an impressive new piece for your house, and you are doing well. And, maybe most importantly, don’t forget all of the savings! So hopefully this list of the best IKEA hacks has provided you with some inspiration! Let us know how your projects turn out in the comments below.